Give some cannabis smoking chemists a legal playground and what do we get? Yes, one of the many strides cannabis has taken since states started to legalize cannabis has been with cannabis concentrates. I'm sure you always thought terms like wax, oil, shatter and budder were all synonymous. Smoked one, smoked them all. Well, while they are all extracts made from either butane (BHO) or co2, the way they are made, smoke and, most importantly, retain terpenes is very different. Thanks to the way it’s made (we’ll get into how in just a bit), it’s able to retain a ton more terpenes and monoterpenes. Some of you are probably wondering what the hell these are. Terpenes are various hydrocarbons found in the essential oils of not just cannabis, but any plant. They come in all kinds of molecule weights and structures, which do some pretty crazy things. They control the way the plant smells and tastes. And currently, cannabis has over 100 terpenes that have been identified. A lot of the current concentrate extraction methods purge the cannabis of these terpenes. I don’t know about you, but one of my favorite parts of cannabis is the taste and the smell! So, any cannabis concentrate that can retain these better sounds like something I want to try! Say What? How Do You Keep All the Different Concentrates Straight? Once you start digging into the many, many different types of cannabis concentrates, it's easy to get confused. Waxes, shatters, budders, nug runs, bud runs, and more. Even more confusing, depending on where you live you may see all these names used interchangeably. How do you keep them all straight? RuffHouse has put together one of the easiest to understand guides, with demonstrations of the product, to help you get the picture. How to Make Resin that's "Live"
While it’s not advisable, you can buy a closed loop system and make BHO at your house. Unlike BHO, however, it is not as easy to make. Only serious chemists in serious labs should even attempt trying to make some. As soon as cannabis is cut down, it begins to lose its terpenes. In fact, through the drying and curing process and all of the handling it goes through can cause it to lose as many as 60% of its terpenes before reaching your joint. To bypass this, freshly harvested cannabis is frozen as soon as it's cut. It’s handled extremely carefully to make sure the trichomes stay as intact as possible. If you want to make a decent amount, you can picture how big the freezers for these plants need to be! the drying and curing process and all of the handling cannabis goes through can cause it to lose as many as 60% of its terpenes. And, because the plants were never dried, they have a much higher water content. This excess amount of water means you need to make it at low temperatures. Not your freezers max 0° either. No, the butane you use needs to be between -20° and -50° F.
This is why you can’t do this at home, kids. You need highly specialized commercial grade equipment. Once you run the cold butane through the cannabis plant matter, the butane will start to bond with all of the cannabinoids. This subfreezing concentrate is then passed into the second chamber where a lot of the impurities such as fats and waxes are removed. You still need to remove the butane from the concentrate, so it’s brought up to a light boil to burn it off. Once all of the butane is boiled off, you’re left with a pure concentrate that is full of terpenes and various cannabinoids. The extraction technique mimic BHO extractions in many ways - including the solvent. However, to maintain the integrity of the terpenes throughout the process, the plant material is frozen beforehand. Most producers store the fresh, trimmed flowers at -10°C for no more than 36 hours. Any longer and the plant starts to degrade in the cold temperatures. Freezing the water molecules inside the plant facilitate a smoother extraction with butane as well. Because the frozen water allows the butane to better bond to the cannabinoids. It avoids pulling out other plant cellular materials at the same time. Unless you are a chemist straight out of Breaking Bad and have access to tens of thousands of dollars of specialized lab equipment, making it yourself is impossible. You need accurate equipment and highly technical know-how. Unlike rosin, which you can easily make at home in small batches with a hair straightener, you actually have to know what you are doing. Plus, because its a process which uses highly flammable solvents (butane) and heat, its dangerous if done outside of a proper lab. Butane honey oils made in backyard labs have led to more than one home explosion. It's highly recommended to stick with the professionals instead of making your own. Most often cannabis concentrates go straight into the dab rig. Dab rigs work the best if you care about terpene (flavors) and cannabinoids (potency). The high temperatures achieved by the dab rig help get the most out of these two properties. However, dabbing can make for an intense experience. You can also dissolve it into a fatty infusion, such as butter, coconut oil, and olive oil. When incorporated into a delicious edible, you’ve got a tremendous high ahead of you. You can also smoke it in more conventional ways. Spread on to a blunt paper, roll up into a big old bat. Dab inside a glass bowl, and topped with a pinch of kief. As I'm sure, you've noticed by now that, although it differs from wax, oil and shatter in many different ways that they are still just a concentrate. This means you'll smoke it no differently than you would any other. You should try to use either a pen or a dab rig with an e-nail to be able to smoke with the perfect temperature. If your dab​​ nail is too hot, you won't be able to enjoy its flavor to the fullest extent. If you want a more in-depth guide, read out complete guide on how to smoke dabs. If you don’t have a dab rig, you can still smoke live resin (and any other concentrate for that matter). Technically a dag rig reaches the ideal temperatures for the product, but a bowl, bong, or pipe will get the job done. A dab rig reaches temperatures ranging from 500° F to 900° F.
Still, people like to improve their smoking experience by smearing a little resin along the inside of the bowl, then topping up with kief or flower. This smearing technique is called twaxing. You can also use this method to spread the resin on the inside (or outside) of a blunt before smoking. All extracts can be vaped, given the right vape pen or rig. Depending on your vaporizer, you may be able to place the live resin directly into the chamber. Some vape pens, with refillable chambers, are set up to vape straight concentrates - no matter the consistency. If you have a vaporizer which uses vape juices, you’ll need to make an e-juice with an additive or purchase a ‘live resin’ juice. This might be hard to find, so you may need to make your own. A vape juice made with concentrate is typically dissolved in a vegetable glycerine to liquify it. These types of vape produce are less preferred because they could be damaging over the long term to your respiratory tract. Depending on what they are mixed with of course. Why Should You Care About the Terpenes? You’ve likely heard about the many beneficial qualities of cannabinoids. THC and CBD are by now well established for their medical benefits. Researchers are now just as interested in terpenes. Cannabis contains hundreds of terpenes, which have very similar benefits to human health. Working with and boosting those already understood from cannabinoids. Live resin helps to preserve these terpenes, which are much more sensitive to heat than THC or CBD. During regular extraction methods, the high heat destroys many of these delicious and aromatic essential oils. But the live resin process helps to preserve them. Depending on the terpenes present, you can see a wide range of colors in a live resin. Some people associate darker colors with poor quality extracts, but this is a misconception. From bright yellows, golden browns, to hints of green, live resin comes in many earthy colors. It might even come in different consistencies, but should always be clear rather than opaque. Essentially, depending on what terpenes the original strain contained, and what survived the extraction process, all determine final coloration. When storing any concentrate, you only have a few options that are going to work. Remember, this stuff is sticky. And you need to consider that, or you'll be wasting a lot of concentrates. Either one works well, but because of the texture of live resin, I prefer containers over wax paper. You can opt for a glass jar if you plan on storing your goods long term since it will do a better job of keeping the resin fresh. It will, however, be a pain once you have to clean the jar. If too much gets stuck in a glass jar, using oven mitts or tongs, hold the glass upside down over wax paper and lightly heat the outside of the jar with a torch. This will cause the resin to melt off the glass and onto the paper slowly. For short term, though, I recommend silicone jars. 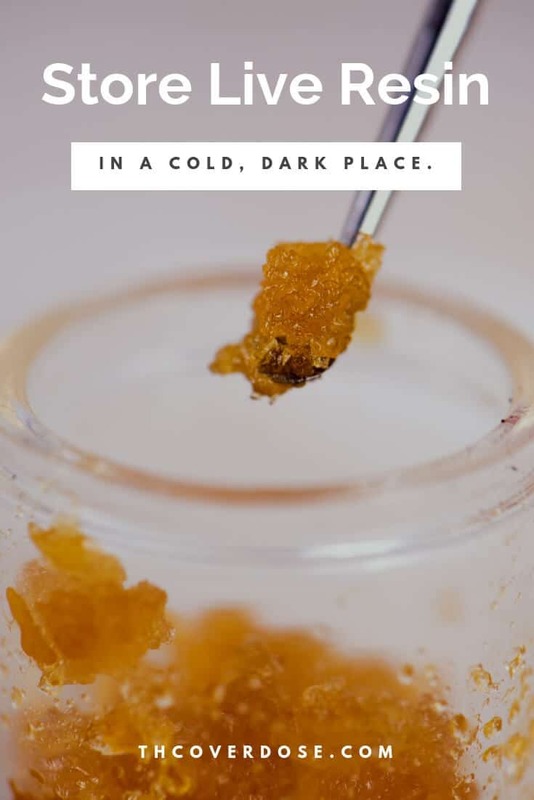 You want to keep live resin in a cool dark place. Some people even prefer to keep their concentrates in the freezer or fridge. I've just always preferred my cupboard or closet. With all of the new tech, it can get a little hard to follow the names of different forms of cannabis. To compare live resin to rosin, we first need to take a look at what rosin is. Most concentrate you can only find in a dispensary. They require commercial grade equipment and brilliant people to operate them. This puts them out of the reach of your average amateur chemist. No solvents or dangerous gases. To make rosin, you just need a hair straightener and some high-quality cannabis. Put the flower under pressure with the straighter for a few seconds, and you're left with a thick concentrated oil. Some dispensaries are offering to rosin press flower for their customers now, because of its growing popularity. When compared to live resin, though, rosin doesn’t retain near the same amount of THC, CBD or terpenes. They are both highly potent, but when given the option of the two, you’ll always want to smoke live resin or rosin. Live resin is usually a pretty gooey concentrate. Wax, on the other hand, is much thicker and oily. It can be eaten or vaporized just like live resin, but unlike live resin, it's made with cannabis that has been dried and cured. It’s also always made with butane and is commonly called BHO for butane honey oil. Wax is soft and not as see through as shatter is. Wax can come in either a creamy consistency where it's referred to as budder or a crumbly version that people call honeycomb wax. Since it’s made from dried cannabis, the terpene retention isn’t as strong in wax. A side by side comparison between shatter versus live resin reveals one major difference, the texture. Live resin is gooey, sticky, and spreadable (most of the time). Shatter is, as the name suggests, quite fragile. Its texture is comparable to glass, and may even ‘shatter’ when handled. Like other more conventional concentrates, shatter is also made from the cured flower, not the fresh buds. Shatter is typically made with standard extraction techniques, petrochemical, and solvent extraction methods. Like live resin, it would be challenging to replicate the shatter process at home because of the technical aspects of the process, and the laboratory equipment. Butane honey oil (BHO) and live resin have a lot in common, when it comes to consistency and versatility. Both are ooey, gooey, honey-like (most of the time). Both content very high potencies of cannabinoids, typically THC. Both use a similar extraction process. BHO uses perfectly dried and cured buds, while live resin, as we have discussed uses frozen fresh buds. You can use both products in very similar ways, but one could have a more developed terpene profile than the other. 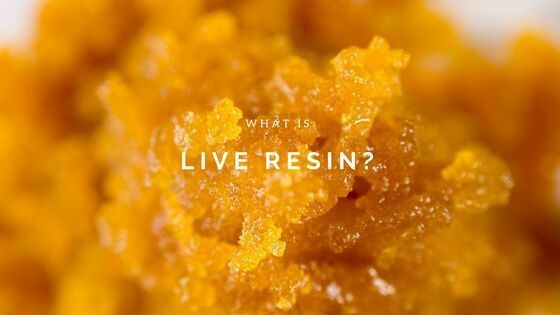 Live resin will also be a bit more expensive, as its still considered a premium product. Since its inception, live resin has been marketed as a premium product that protects the delicate terpene profile of the original strain. 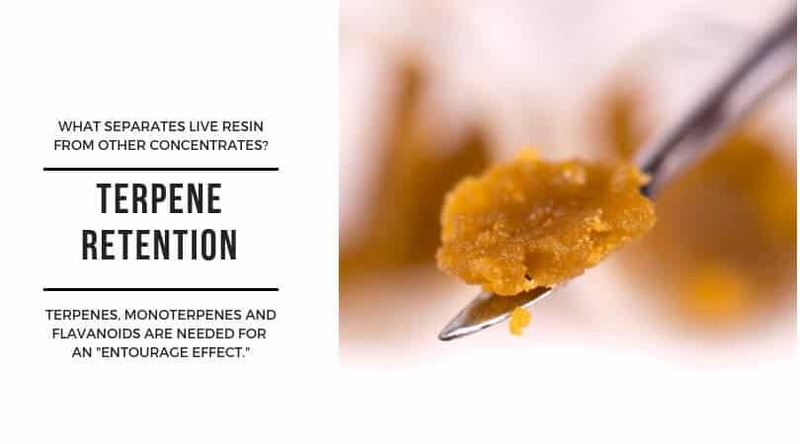 Although it does generally contain higher levels than conventional concentrates, the assumption that all live resins have complicated terpenes is false. Usually, they have a profile heavy on the less-sensitive terpenes, but still, fail to protect all of them. Another misconception, partially because of the higher price point of the live resin, is that it's always of higher quality. Generally speaking, brands which produce life resin know what they are doing, but not always. To avoid poor quality live resins, stick with brands you trust. Live resin is something any serious cannabis connoisseur should try. The number of terpenes they retain make for an entirely different smoking experience. It's made differently than any other resin because instead of using dried cannabis, they use fresh plants that have been flash frozen. You can use it in any pen you’d smoke wax or oil out of, and any old dab rig. How do you feel it stacks up compared to the various other types of concentrates? We’d love to hear it in the comments section below!